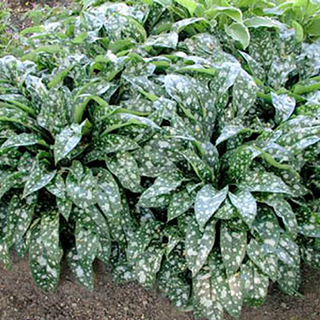 Lungwort, a member of the Borage tribe, is found in woods and thickets, but is not common, and is by some only regarded as an escape from gardens, where it is cultivated now mostly for the sake of its ornamental leaves, which are curiously spotted with white. An infusion of 1 teaspoonful of the dried herb to a cup of boiling water is taken several times a day for subduing inflammation, and for its healing effect in pulmonary complaints. It can be grown from seed in containers in spring, but hybrid varieties are considered superior to species plants and have better colour and a longer blooming period. Since lungwort doesn't come true from seed, dividing is the best method of propagation. Division should be made in late spring after blooming or in early fall. Space transplants 30 to 45 centimetres apart and provide plenty of water to help them re-establish. The leaves as well as the flowering stems of lungwort are harvested during the spring and dried up for use when necessary afterward.